This decadent dessert is a rich source of thiamine (vitamin B1) thanks to the macadamias and cashew nuts which increase acid in the gut, aiding digestion. Coconut is rich in the anti-inflammatory lauric acid and berries are packed with antioxidants, making this a health-boosting way to end a meal. CNM recommends the use of organic ingredients. 1. Start by making the berry coulis. Blend the frozen berries in a blender/food processor to create a purée. Pass the purée through a fine sieve to remove the seeds and sweeten with the maple syrup (to taste). Refrigerate the berry mixture for later. 2. Pre-heat the oven to 180°C/350°F/Gas 4 to prepare the base. Grease tall pastry ring moulds lightly with coconut oil and set aside on a baking tray. 3. Spread the macadamias onto a small tray and roast for 5–10 minutes until golden. Allow to cool. 4. Place the macadamias and the remaining base ingredients into a high-speed blender and blend to combine – you want the macadamias to be relatively finely chopped but still retaining some texture. 5. Place even quantities of base mix into the bottom of the moulds and press down with the back of a spoon and chill. 6. To prepare the mousse filling, place the agar flakes in a small bowl and sprinkle over the top with water; allow to soften for 10 minutes. 7. Gently heat the coconut cream in a small saucepan until hot. Add the softened agar flakes and water and bring the coconut cream to a boil without stirring, then simmer for 5–10 minutes, stirring occasionally to allow the flakes to fully dissolve. Remove from the heat, decant into a clean bowl and allow to cool to room temperature. 8. Drain and rinse the cashews and, along with the remaining filling ingredients, including the coconut mixture, place into a high-speed food processor and blend until smooth. 9. Decant equal amounts of the mousse filling onto the chilled bases and continue chilling for a minimum of 2 hours to firm up. The desserts can be securely covered and chilled for a couple of days. 10. Take the desserts out of the fridge 30 minutes before serving and leave at room temperature. 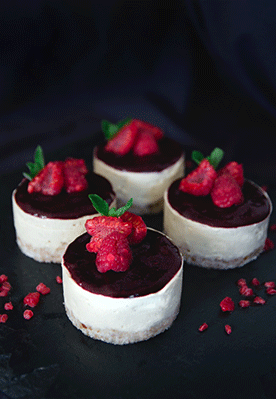 Then transfer to your serving plate, slide off the pastry moulds and spoon over the berry coulis topping. Note: The dessert keeps for up to two days in the fridge and can be made a day in advance. The base can be frozen but the mousse may split so best to make fresh.